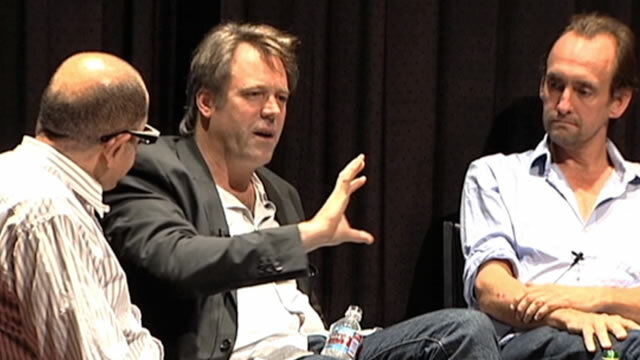 Wally Pfister (AFI Class of 1991) won the 2012 Franklin J. Schaffner Alumni Medal for his mastery of cinematography and his passion for storytelling excellence. This month marks his debut as a film director when TRANSCENDENCE, a sci-fi tale starring Johnny Depp as an Artificial Intelligence expert, opens in theaters April 17. Pfister returned to the AFI campus in 2008 to talk shop with AFI’s distinguished Scholar-in-Residence James Hosney; production designer Nathan Crowley; Senior Filmmaker-in-Residence Stephen Lighthill and Fellows. Here he discusses a bold lighting suggestion from director Christopher Nolan for THE DARK KNIGHT (2008).